You want the freedom and flexibility that comes with being a freelancer… the only problem? You have no idea how to get started. …And you feel overwhelmed because you don’t know what you should focus on, when. …And, let’s be honest, you’re crunched for time. You’re a busy person! Who has time to start a business? In this comprehensive and reassuring step-by-step guide, you’ll learn exactly what you need to do to begin (and build!) your freelance business in just 15 minutes/day. Being a small business owner isn’t about racing to the finish. It’s about taking small, strategic steps that take us closer to our goals, every stage of the journey. It’s about enjoying the process. It’s about making progress, not getting everything perfect immediately. And now, all of that can be yours. 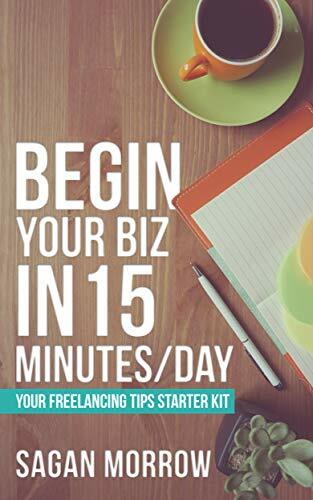 The secret to freelancing success is right here, in your Freelancing Tips Starter Kit. We can all spare just 15 minutes out of our day to work on our business. Ready to make your business dream a reality? Let’s get started!